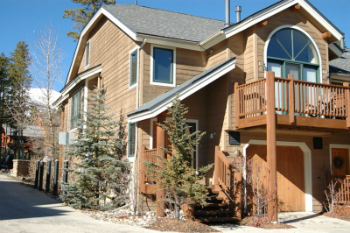 Large Elk Ridge townhomes are located across the street from the base of the Snowflake Lift. They were built in two phases around the time this lift was installed, in the valley between Peak 8 and 9, and makes both accessible to residents of this neighborhood. Return home to Elk Ridge via the Snowflake or Four O’clock runs, and head out to ski by the Snowflake Lift. In the summer, the runs are unpaved walking paths that lead up the ski mountain and connect with other trails into the national forest. Because the Elk Ridge townhomes for sale are located in the middle of Kings Crown Road, the base of Peak 9 is also not far away, and one could walk to the lift at Beaver Run, on onto trails that radiate from that area. You can start browsing the Elk Ridge townhouse listings below, or find out more about living in this Breckenridge neighborhood. 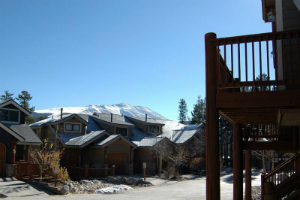 Elk Ridge is on the ski slope side of Breckenridge and so the best views will be across the valley to Baldy Mountain, and the eastern, morning sun should help to wake you for a new day of skiing or summer recreation. Built in the late nineteen-nineties, these townhomes are horizontal wood sided, have lower level garages and two floors above, with simple trim and architectural windows. All have some basement space and some are garden level. All have a balcony, and a very small footprint. As is common with townhomes there is common maintenance for most of the exterior but a little bit of private space. The heart of downtown Breckenridge is only a couple of blocks down Four O’clock road, which is a paved street served by the free town shuttle bus. Size: 2196 to 2642 sq. ft.
Drive one-half mile up (west) 4 O’clock Road and turn left on Kings Crown Road. Elk Ridge is located on the left and are the third condo complex from 4 O’clock. The knowledgable agents from Breckenridge Associates are ready to help you confidently navigate the local real estate market. Contact us today.